Visual Q Eyecare in South Yarra is proud to announce the arrival of over 20 new models in the ProDesign ‘Essential’ and high-end ‘Iris’ ranges, just in time for Spring 2012. How cool are these new ProDesign Iris frames? There are 14 new ‘Essential’ frames, with 10 acetate models and 4 metal. 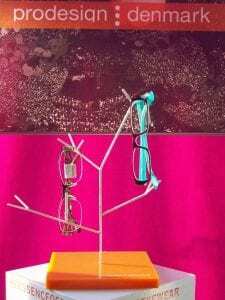 The plastic frames come in up to 14 magical ProDesign colours, while the 4 metal frames are semi-rimless and come in up to 7 different colours. These ‘Essential’ designer frames have a very modern look, yet with a retro style. A special ‘milling’ technology has been used to create hexagonal shapes that expose second colours beneath the main external coloured frame. By milling away the acetate material, secondary colours are exposed – a simply technology, but results are beautiful. Sci-fi buffs may think these frames are reminiscent of the clothing worn in the futuristic ‘Tron’ films. The new metal ‘Essential’ frames also come in a retro style, with thin rims and a triple layered colour effect. Lens shapes can be either rectangular or round. This is simple Danish design, but incredibly well executed and nicely finished. ProDesign Essential frames cost between $349 and $399. A new ProDesign Essential frame in their signature colours. ProDesign’s high-end ‘Iris’ range now has 7 new designer frames, 4 of which are metal and 3 acetate. The new metal frames come in up to 9 colours, while the acetates come in up to 8. These boldly coloured frames remind us of Melbourne’s Federation Square – they are very ‘architectural’ in appearance. An amazing 3D temple design is less busy than its predecessors, but its colour combinations are anything but mundane. This is truly exclusive eyewear. Metal Iris frames used to have an enamel jewellery look, but now they are more modern with metallic dual tones. A reverse colour effect creates 2 colours that wind around each other – simply awesome! The new acetate Iris models come in extremely vibrant tones, and have ProDesign’s unique offering of optional nose pads – the only company that has plastic glasses frames with this functionality. One new acetate model comes in ProDesign’s signature blue and brown colour combination. We love it! ProDesign’s high-end Iris frames cost around $579. Look at the incredible design used in the arms of this new Iris frame. Awesome. Come down to Visual Q Eyecare in South Yarra and we’ll take you through the new ProDesign frames, one by one. There is no better way to enter Spring than by expressing the bold and fun elements of your unique personality. ProDesign are the masters of colour, and we at Visual Q want to see more of it in Melbourne. Say goodbye to grey skies and boring glasses!